HEAVY TRAFFIC IS building on roads across the country as an extra 150,000 commuters make their way home due to Irish Rail workers taking part in their first day of strike action. Negotiations between staff and management have been ongoing for a number of months with many workers claiming they had not received a pay increase in the last 10 years. However, a breakdown in talks led travel union issuing notice of their intention to strike on five days – the first being today. Private bus operators have been attempting to ease congestion by putting on more services while taxi firms have offered deals to potential passengers. Pickets have also been placed at a number of stations. AA Roadwatch had said it expected a significant increase in traffic on the roads as a result of the strike action and they were right. Many areas in Dublin, Cork and Galway cities experienced heavier volumes of traffic than usual from this morning, with similar congestion likely as people make their way home after work. AA Roadwatch reports that traffic volumes in the capital are already picking up, with quite heavy traffic northbound on Macken Street towards the Samuel Beckett Bridge. On the Stillorgan Road it’s busiest outbound between Trees Road and Kilmacud Road Lower. There are also delays approaching the Merrion Gates from St. Vincent’s Hospital on the Merrion Road and from Sydney Parade Ave on Strand Road. Traffic is slow on the M50 southbound at Junction 5 Finglas and northbound at Junction 13 Sandyford. Meanwhile, the Dublin Port Tunnel southbound has since reopened following incident earlier, though delays remain. A serious accident has resulted in road closures in Wexford. Gardaí are also dealing with a collision on the M1 southbound after Junction 5 Balbriggan South, which has been moved into the hard shoulder. Strike action has resulted today after members of the National Bus and Rail Union (NBRU) as well as Siptu urged management to give them a 3.75% increase in their salaries. Management countered that by offering a 1.75% rise which would be coupled with efficiency targets. Last week, Siptu said its members at Irish Rail had voted by 84% in favour of industrial action. NBRU members, meanwhile, have voted 92% in favour. Irish Rail said it regrets the decision by the unions Siptu, NBRU, TSSA and Unite to schedule the five 24-hour strikes. Business group Ibec said the strikes would cause “massive and unnecessary disruption to the travelling public and businesses alike” and called for renewed efforts to halt the impasse. General secretary of the National Bus and Rail Union Dermot O’Leary said that the Department of Transport, the National Transport Authority, the transport companies and the unions all needed to come together to discuss pay in the public transport sector. The NBRU says that the strike revolves around a lack of pay rises for staff over the last decade. Staff are seeking a 3.75% pay rise. They believe that the National Transport Authority is underfunding the company. An NBRU statement apologised to the public for the disruption. Email “Heading home? Expect delays as Irish Rail strike means there's an extra 155,000 people on the roads”. Feedback on “Heading home? 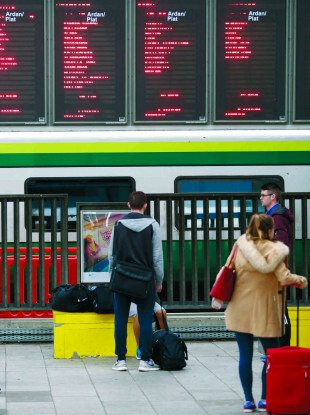 Expect delays as Irish Rail strike means there's an extra 155,000 people on the roads”.